What to make for dinner. Isn’t that the struggle? 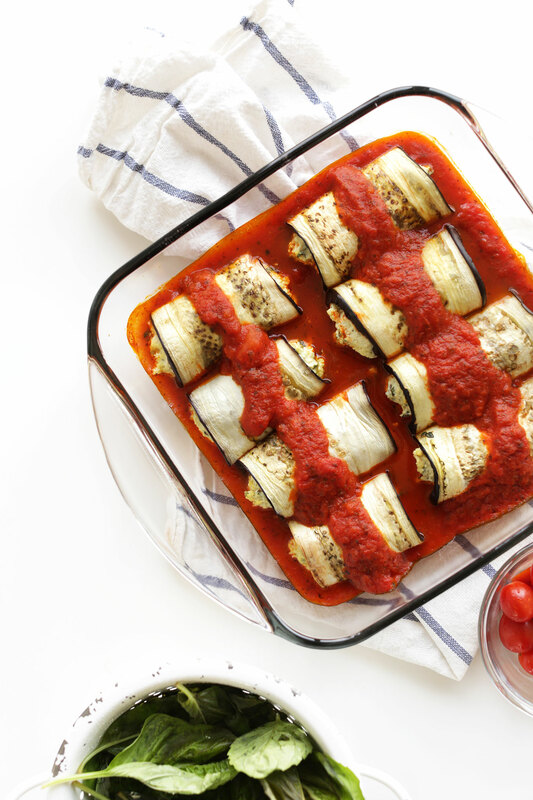 Well struggle no more, friends, because 10-ingredient Vegan Lasagna Eggplant Roll-Ups are here (and they’re crazy delicious)! This recipe is inspired by my all-time favorite Italian dish – Lasagna! Have you ever contemplated what your “last meal” would be if you had to choose? It’s a tough call for me, being that I love all food. But forced to decide, I think lasagna would rise to the top of the list. It’s classy soul food stuffed with fresh herbs and robust flavor. This creamy combo comes together quick (5 minutes!) and adds some serious staying power to these rolls – 6 grams protein per serving! Look at that goodness. I want to put it on everything, STAT. Instead of traditional lasagna noodles I opted for thinly sliced eggplant to add more veggie power and keep these babes gluten free! To help them achieve a slightly roasted flavor and soft texture, I simply par-baked them for 15 minutes. Then all that’s left to do is add the filling for one seriously delicious and healthy meal. All in all this dish requires 10 ingredients and roughly 1 hour start to finish! That’s my kind of dinner. This would make the perfect weeknight meal when you want something a little extra special. It would also be great for impressing guests, especially a vegan / gluten free crowd. Bonus? They reheat well the next day for leftovers (hello, lunch upgrade). We hope you love this recipe! If you try it, let us know how it goes. Leave a comment or take a picture and tag it #minimalistbaker on Instagram so I can come stalk your feed and leave embarrassing comments. Cheers, friends! Thanks for following along and supporting what we do. 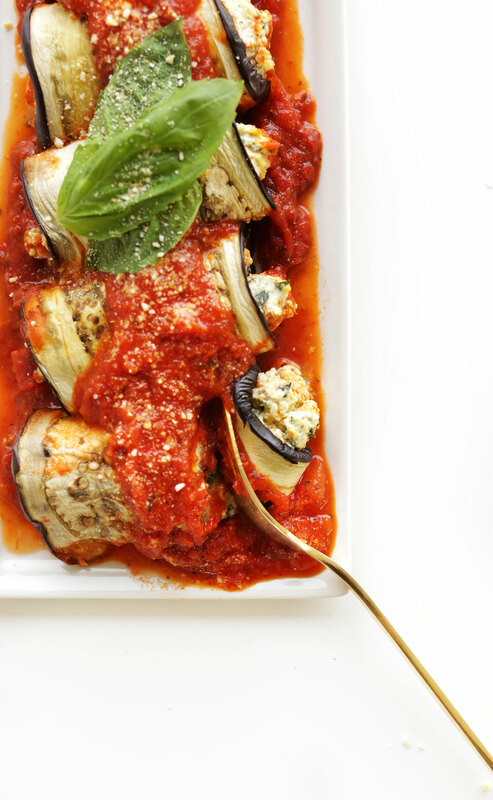 EASY, 10-ingredient vegan lasagna roll ups made with a flavorful, protein-rich tofu filling rolled up into roasted eggplant slices! Healthy, rich in whole foods, and so satisfying. Arrange slices on 1-2 baking sheets in an even layer and bake oven for 13-15 minutes. Set aside and reduce heat to 375 degrees F (190 C). While eggplant is baking, add all tofu filling ingredients to a food process or blender and pulse to combine, scraping down sides as needed. 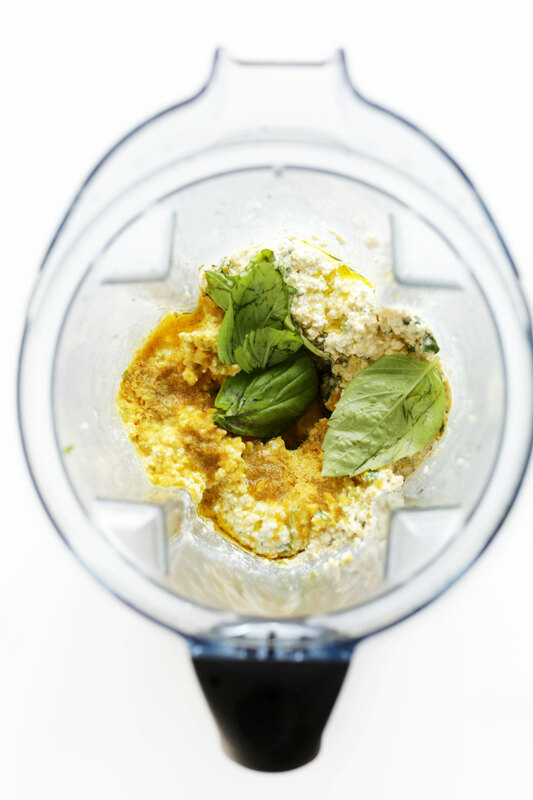 You are looking for a semi-pureed mixture with bits of basil still intact. Taste and adjust seasonings as needed, adding more salt and pepper for flavor, nutritional yeast for cheesiness, and lemon juice for brightness. Pour about 1/2-1/3 of the marinara sauce into an 8x8 baking dish (or similar sized dish) and reserve rest of sauce for topping / serving. Set aside. 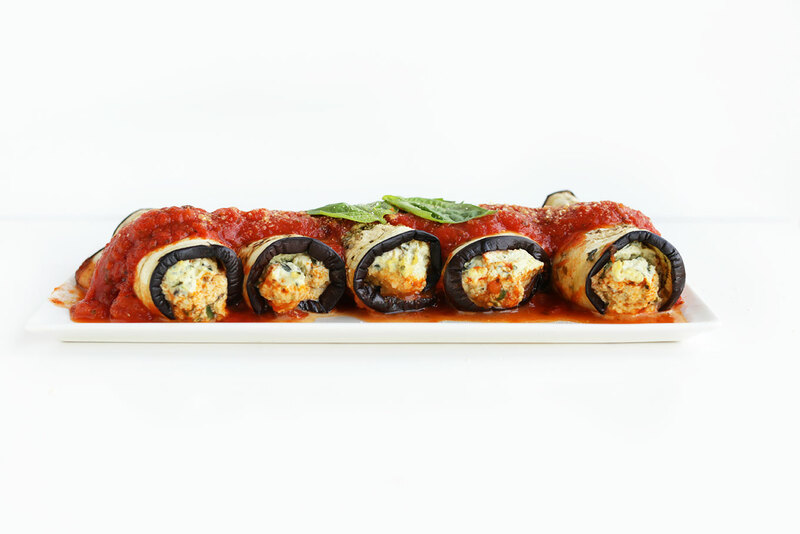 Scoop generous amounts (about 3 Tbsp) of ricotta filling onto each eggplant slice or lasagna noodle and roll up. Place seam side down in the sauce-lined baking dish. Continue until all filling and noodles or eggplant strips are used up. Pour more sauce down the center of the rolls for extra flavor (see photo). Bake for 15-23 minutes, or until sauce is bubbly and warm and the top of the rolls are very slightly browned. Serve immediately with additional vegan parmesan cheese and fresh basil. Leftovers keep for a couple of days, though best when fresh. *Eggplant cutting tip: Slice off the bottom and top of eggplant and sit it upright. Then use a sharp knife to make thin slices, about 1/4 inch thick. Alternatively, use a mandolin. *2 lemons make ~1/3 cup juice. *Adapted from my vegan stuffed shells. Feel free to add sautéed veggies to the filling mixture for more fiber / nutrients. My favorite is sautéed zucchini. *Tofu inspiration from Whole Foods. *Eggplant inspiration from Food Network. *Nutrition information is a rough estimate calculated with the lesser amount of oil and marinara and with 1/4 cup vegan parmesan cheese per 12 rolls. I do not boil the noodles beforehand but make the sauce slightly more watery and bake covered. They cook marvelously! Can’t wait to make this! Could I prep the rolls the night before and refrigerate. Also wondered if I could substitute the eggplant slices in your easy Lasagna recipe?? Thanks so much for the kind note, Michelle! We think it would work well to prep the night before! And yes, we think eggplant noodles would work well in our Easy Vegan Lasagna- you may want to refer to this recipe for additional guidance. Hope that helps! This was AMAZING! I used half the amount of lemon juice for the vegan ricotta and it was so delicious. My boyfriend was super impressed and wants to have it more often! We love your recipes!!! Woohoo! Thanks for sharing, Katie! I made this recipe tonight and it was delish! My boyfriend who is a meat eater really enjoyed it as well and it was easy to make! 1. Do you need to do the salt and rinse steps if using zucchini? 2. I’m assuming you still want to par-bake it when using zucchini, correct? I made this for Christmas and made the tofu filling just now. Loved it! The tofu filling tastes exactly like ricotta. Having grown up in an Italian house and making lasagna, never would I thought I could find an equivalent to ricotta, but I’ve found it! It’s amazing! Thank you, again! Is there something other than a tomatoe-based sauce that this would go well with? I absolutely love all your recipes and just had some blood work done and it came back saying allergic to the following: oats, strawberries,carrots,tomatoes,apple,&corn (aka very yummy things). Thanks for all you do & looking forward to your thoughts! Would soft tofu work in place of extra firm? Hmm we haven’t tried using it, but if you experiment with it, report back! Hi Steph! Generally, I wouldn’t recommend substituting silken for firm or extra-firm tofu, but if you experiment with it, report back on how it goes! The tofu ricotta was insane. I served this with lentils and spinach, also in a healthy amount of tomato sauce. For me the eggplants didn’t add too much (I might have prepared them incorrectly), so next time (tonight) I’m going to stick with lentils and spinach in tomato sauce then serve with the ricotta and vegan parm. Excited to try those with other dishes as well! We are glad to hear that you enjoyed it, Will! These are delicious. I added a shallot and the zest of one lemon into the food processor with tofu filling and topped with red pepper flakes. Perfect. And we are a no-nut family so used my version of the vegan parm, which basically subs hemp seeds and sunflower seeds for cashews. Can’t wait to bring the leftovers to work this week. A word of caution for mandolin users: err on the side of thicker-than-you-think-it-should-be eggplant. I wasted a bunch of thin, crispy slices today. Thanks for developing great recipes for us! In a word…DELICIOUS! Savored every mouthful. My eggplant was too short for roll ups so I layered it with the ricotta. My tofu-hating husband liked it too. Will definitely be making this again. It’s a keeper! Whoop! Glad to hear it, Maureen! I have now made this recipe probably five or six times and it gets easier and faster every time. Someone commented that you can’t make this a weeknight dinner if you’ve got kids and a job. Well, it’s Wednesday night and I have twin toddlers and a full-time job, and kids, hubs and I are all fed and there’s leftovers for lunches tomorrow. This recipe works really well exactly AS IS and I find that it helps to do it in steps. And the recent gift of a mandoline creates perfect eggplant “noodles.” My husband is not vegan but does love eggplant and never stops raving about this dish whenever I make it. The littles loved the filling but are still getting used to the eggplant texture. I give it another few months before they’re in love with it too. Thanks for such hearty, flavorful vegan recipes!! Yay! We are so glad you and your family enjoyed this recipe, Jacki! 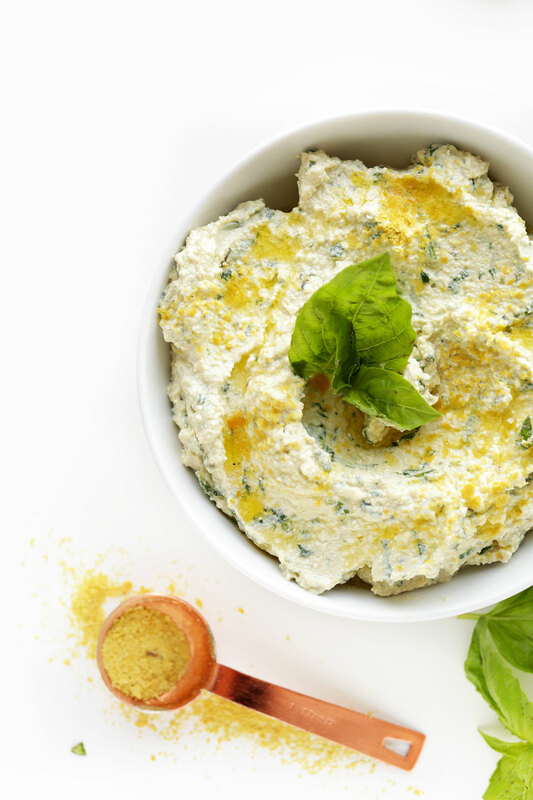 The tofu ricotta alone is something I want to have on hand all the time, would be great as a veggie dip or a sandwich spread. The only thing I changed was sautéing up some yellow squash and throwing that into the ricotta for extra fiber and creaminess. I definitely made too much and froze half of the baked rolls. I’ll let you know how it turns out, although I’m sure that thawed and microwaves, it will taste delicious with all the flavors. This also took me about 2 hours from start to finish (including all the dishes) so it’s not super week night friendly but I like having a cooking project if I get home from work early and I can save it for the next couple lunches. Just an update, froze this after I baked this and it warmed it great in a microwave. It doesn’t look ‘presentable’ but it tastes great. Perfect! Couldn’t get enough of it! Time consuming, but worth it. A real feast for your taste buds! Will make again, especially when I want to impress someone! Oh my goodness!!! These are amazing!!!!! You’ve done it yet again! You are always my go to for new recipes! I loved this recipe. Having never really used eggplant before… and with limited knowledge on how to make tofu taste good… this was a really easy recipe to make. It is SO tasty… I was shocked by how similar the texture and taste of the tofu was to ricotta. Will definitely be making this again! I made this tonight. Ok my variation of it and it was pretty dope. Veggie lasagna with tofu ricotta. Eggplant zucchini bell pepper onion carrot and spinach. I also had some nut based pesto dip and spagetti sauce added. Delicious. Not bad for my first lasagna ever. Made and 8×8 dish and a 8inch round baking dish. Way more food then the bf and I could eat. So I shared a pan with my sister and her family. And also gave a serving to a girlfriend. And I still have leftovers. Btw that tofu ricotta is bomb! The bf doesn’t know it was tofu! Added fresh basil and fresh oregano and Italian seasoning. Definetly a recipe to make again! I love your recipes! Even though I never quite follow them exactly, they are great even with substitutes and variations. Thanks for the great vegetarian/vegan recipes. I just purchased your book and can’t wait to make more yummy food. It looks so yummilicious!! Keep sharing and caring!! I made this last night and it was so delicious!!! I had to start over on the eggplant noodles because mine burnt in the oven during the first part of the process. I also used your Moroccan lentils recipe for the sauce! My husband ate it too and he’s normally a complainer with my vegan food. But he liked it! I made this eggplant dish for a family Christmas dish and got so many compliments! Love all of your recipes! Thank you! I absolutely love this dish! I’m making it again for more people and one of them is allergic to tomatoes. Is there another vegan sauce that would go well with this? Hi Grace! You could try a cream based sauce. I would go off of this one for inspiration! So delicious but um, “weeknight dinner?” Not if you’ve got kids or a job sister! I am a non-vegan cheese lover, and I found this recipe when a few co-workers suggested we do a vegan detox for a few days around the holidays. THIS RECIPE IS SO GOOD and SO filling! I struggled with cutting the eggplant, so I ended up just layering it like a lasagna/casserole and then baking it. My boyfriend had no idea he was eating tofu and raved about how “it’s so good and cheesy.” Thank you for the recipe!! This came out amazing! I used zucchini as well because I can’t eat eggplant. It was a hit! Hi Dana! Can I use soft the ricotta? I acquired some from my mom and I find a way to use it up that isn’t in soup (it being summer and all). Thanks in advance! Hi Alexis! I haven’t tried making this one with soft ricotta, but its worth a try! Hope this helps! I have a ninja blender, like the smoothie kind, would that work for the ricotta? I know this is an older post but I really wanted to thank you for this recipe. I made it last night and it blew me away. My son and I are dairy free due to protein allergy and lactose intolerance respectively. Not having cheesy dishes, or finding an acceptable substitute, has been a challenge with my very Italian husband. This was a winner all around. I did add mozzarella to the rolls for hubs and daughter because they can but I was in love just with that ricotta! And the eggplant beat noodles any day of the week. I can’t wait to make it again and to try it in different recipes. I think next time I may even try a double batch and freeze one before baking. Just so I can have it when I want on short notice ? Again, thank you very much. I have really missed these kinds of dishes and am grateful for such a delicious new way to enjoy them. Just made the tofu ricotta. It’s amazing! I had my doubts, but the mouthfeel is spot on. Used only one lemon for the block, and to be honest, I’ll probably use just half of a juiced lemon next time. I can’t wait to put a dollop of this over some spaghetti squash once it gets finished roasting! Will this work with firma tofu? Has anyone tried freezing this? I want to make a big batch for a party. Thanks for this recipe ! Ive made this twice now and im just so impressed every time! We had this tonight and it was amazing. We are carnivores, but enjoy eating meatless a few nights a week. 1) Substituted Cashew and Cauliflower for the tofu. 3) Sprinkled with red pepper flakes. When you bake the eggplant the first time do you have to use oil?? Hi! You slice the eggplant first, then salt it, then rinse, drain and dry it – as instructed. Then, drizzle it with a little olive oil and par bake it. Just follow the instructions and you should be good! We made this tonight (with the eggplant) and it was fabulous! This was absolutely delicious! I usually don’t like too much lemon in “cheesy” vegan recipes, so I only used about 1 tbsp of lemon juice. It turned out perfect, the ricotta tasted a lot like cheese, even to my non-vegan husband. They also look really cute. The only problem (which was totally my fault, not the recipe’s), was that I was unsure how long to leave the eggplants in the oven for before rolling them, so I took them out too early – they were still a bit tough. Make sure those are pretty much cooked before rolling them up with the cheese! I will definitely be making these again! Would love to try wrapping in zucchini like many of the commenters suggested. we are new to the vegan diet. this was excellent. loved it. will make again and again. thank you. I will but the cookbook. we added muchrooms on top for serving!! This recipe is easy and delicious! The only alteration that I made was to add a lot of garlic powder, and that made it perfect for me. Do you think adding cashew cream to the ricotta would be worthwhile, or does the tofu hold up well enough on its own? I want to emulate “creaminess” the best I can. Hi! I haven’t tried doing that but if you give it a try, let me know how it goes! Happy cooking! Again, a great and tasty recipe! However, I enjoyed the dish more with zucchini! I tried making this recipe and my tofu filling tasted super lemony, although I only used one lemon which amounted to less than 1/3c. It made the whole dish taste very strange. Any tips for next time? Is the cheese supposed to taste like this? I’ve never had vegan cheese before so am new to most of these flavors. Hmm, was your lemon fresh? Sounds like it was either bad or you just don’t like as much lemon as I recommend. So maybe next time scale back a little! Can this be made up ahead of time and then baked later? Yes! Up to a couple days. I am planning on making this recipe this weekend for a family member who is gluten free and vegan, of which I am neither. Can I make the “ricotta” filling in advance and then assemble them day of without hurting the flavor/texture too much? Also, where can I find ingredients like vegan parmesan? Thank you! Yes! That’ll work. Vegan parmesan recipe is easy and can be found here! Just finished my leftover eggplant rollups and they were even better the second time around! My husband who really doesn’t like eggplant- thought this was a delicious dish and couldn’t believe the filling was not ricotta cheese. He requested that this recipe go into our regular rotation. Will be a great meal to feed our vegan daughter and the many other vegetarians in the family. I did bulk up the filling with sauteed peppers, onions and the rest of the eggplant that couldn’t be made into strips for the rollups. Love your website! Amazing turn out!!! I followed your recipe exactly and then proceeded to add vegan mozzarella cheese atop everything. It all baked beautifully and deliciously. My new favorite dish (I can make)! This tofu ricotta is RIGHT. I love it when I can use my food processor for 2 things without cleaning it out in between; first I made the parmesan (another WOW) and then got pulsing the ricotta. 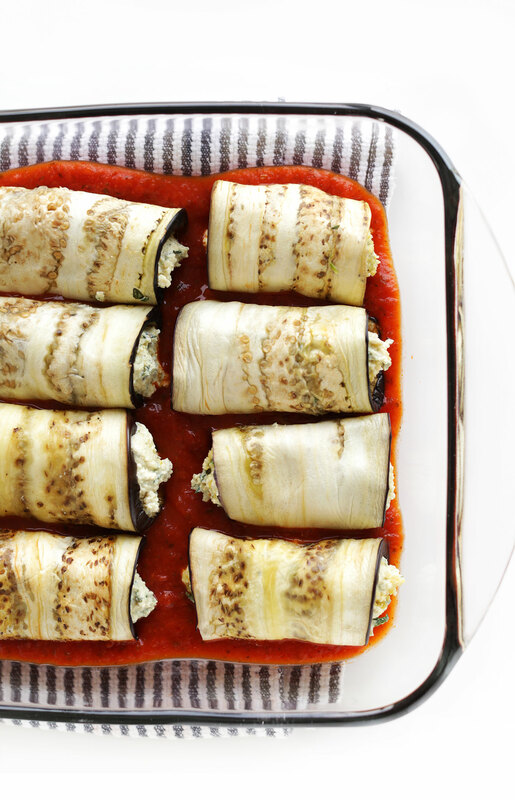 Word to the wise – wait a few minutes for the eggplant to cool before stuffing and rolling! In my excitement to chow, I burned my lil’ digits. Worth it, though. OMG. This was insane. Most delicious thing ever. I love this website. I have made easily 10-20 recipes from you in the last 5 months and they were all amazing. Like best website ever. Just made this tonight while trying to figure out how to use up an eggplant! So delicious. I eat a lot of tofu but never in this form so I was a bit hesitant about it- but I can honestly say I wouldn’t have known it isn’t ricotta if I wasn’t the one who prepared it! I used my own slow-cooker marinara and chopped up some sautéed zucchini and bell pepper which I diced and put on top while it baked. The one thing I found a bit difficult was cutting the eggplant into the right width slices. Might be time to buy a mandolin! Amazing, my vegan stepson and his girlfriend loved it! Honestly I was worried when I was making the stuffing because it didn’t taste that great, even after I added a little more salt & pepper as well as some Lemmon pepper because I love it. But after baked it tasted great, I was told it was the best part. Dana you are awesome! Every recipe I try of yours is great and the best part healthy! I’ve recently gone vegan ( and gluten free for health reasons) and my husband has been struggling with feeling full and the prospect of giving up my cheesey aubergine bake. Well. He just scoffed 6 rolls and wanted more! Just a teeny bit of tamari sauce (or soy sauce) in the mushroom and then stuffed it full of the tofu ricotta. 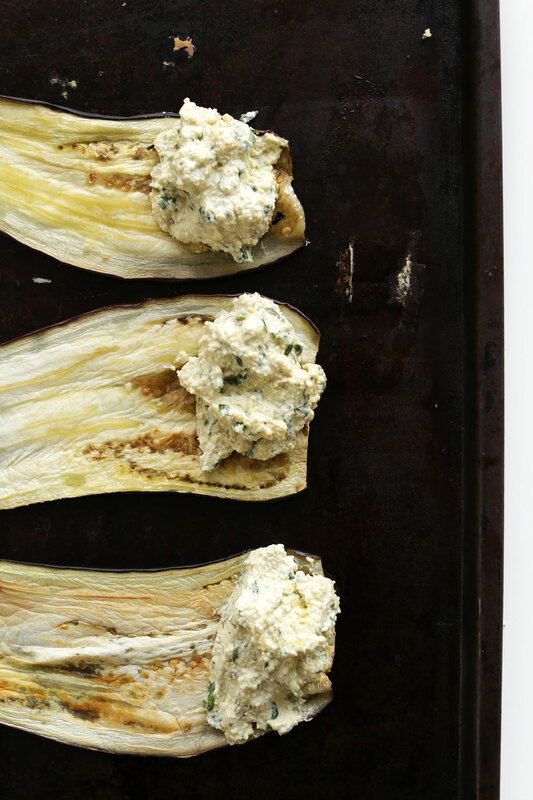 Baked at the same time as the aubergine so just 15 minutes. It was divine! I don’t think I will miss cheese at all. Thank you Dana, your recipes are literally changing my life ? Would this freeze okay? It’s just me at my house and I don’t want any to go to waste. Thanks! Wow, thank god I didn’t use TWO lemons or 1/3 cup in the filling. I used one and it was still wayyyyyy too sour. I had the throw it out. I like the Parmesan idea but cashews are a little sweet, I’d try a different nut next time. Over all though, cute idea! Can you substitute the tofu for anything else? My sister no longer eats anything soy related, and I would love to try and make this sometime because eggplant dishes are one of our favorites! Hi ms. meenie, I just wanted to let you know that I made the tofu ricotta filling tonight with chickpeas instead of tofu and it was fantastic!! I was so excited because my sister also doesn’t eat soy anymore and I am always looking for new recipes that will work for her. Anyways, chick peas worked perfectly! Also, I have made the original ricotta filling for this recipe in the past with tofu which was also delicious. I haven’t been making it with the eggplant just using the filling for lasagna with noddles and sauce. Can you make this recipe a day ahead and refrigerate before baking? Or does the eggplant get soggy? Thanks! I think you could – up to a couple days- but it’s best if you can prepare it fresh. I have tried eggplant, zucchini and regular vegan lasagnes of types from a variety of sources. This is by far the best. The sauce you linked in the recipe is hands down the best marinara sauce I have ever had. It will by my go to recipe for pizza sauce and lasagne from now on. My husband and I have been vegan for a little over 2 years now and of course my family doesn’t get it. It’s year we hosted Christmas Eve dinner and made this and a baked ziti with the left over ricotta and everyone loved it! Even my picky 13 year old nephew! It was delicious, even as left overs the next day. I made this last night for dinner and all I can say is WOWZA!!!! I added finely diced and sauteed onions and mushrooms to the tofu ricotta and topped the dish with Daiya mozzarella. I will be making this one frequently, as it was way easier than traditional lasagna, but just as satisfying. Dana, this is the second recipe of yours I’ve tried and you are a genius in the kitchen!!!! I finally have recipes that can accomodate my food allergies (gluten, eggs, dairy) but are super-delicious…I cannot wait for your cookbook and have it on preorder. FYI..serving your peanut butter pie at Christmas dinner today. YUM!!! Hey Dana, a bunch of bloggers are finding that their content has been stolen and re-published (with no credit) on FareWell.io. I just went on their homepage and saw your recipe there; I thought you’d want to know. Dana, could I skip the nutritional yeast for the tofu mixture? Will it impact the outcome? if yes, any alternatives to it? Thanks! How can you comment negatively if you changed her whole recipe? Made this tonight for supper and it was amazing!!! Thank so much for sharing your recipes!! I tried this. Thank you so much. Thank you so much for this recipe! Your recent 15 amazing vegan dinners guide has been invaluable – I’m vegan but recently have had to go onto a very restricted elimination diet to figure out some allergies for the next couple of weeks. I was wondering what I could make and panicking, but everything on your list was not only suitable but absolutely delicious – so thank you so much! I was short of time (and ingredients) and have just used houmous as a filling – really yummy! I also made my own tomato sauce (tinned tomatoes, onions, garlic, basil and seasoning, puréed) – very yummy indeed! Just wondering: it says to preheat for 425 but then says to bake at 375. Am I missing something? Love this “cheese” can you freeze it or will the texture get ruined? I think it would affect the texture negatively, but if you give it a try let me know! Since I am vegan SOS, i made this without the oil drizzle and it turned out fine. I cheated and used Kite Hill ricotta which is soy free, to which I added oregano and basil as you recommended. It was a hit and am making it again with zucchini instead of eggplant because that is what I have on hand. Thanks for an easy, tasty recipe that is flexible. Haven’t tried Kite Hill, but want to! Did you like it? Yes, it worked very well in the roll ups. It was firm and rather crumbly so when I added the basil and oregano, I also added a splash of almond milk, then mashed it all with a fork and it was perfect. Not only is it vegan but soy free and gluten free with no additives…..just almonds, salt and cultures. So much healthier than the tofutti stuff. These are FABULOUS! Made a batch last weekend and have been eating leftovers all week – I actually think they taste better after marinating in the fridge for a day or so. Will endeavor to take photos next time around – this first try was a little messier than planned. I have to say I am absolutely in love with your website. I’ve turned to it numerous times in the past several months since stumbling upon it looking for a vegan dish which I cannot remember now- maybe ratatouille? Since then I have made so many dishes and have spread the word of your wonderful vegan adaptations which I take pride in re-creating to taste like its original savory meat/dairy counterparts, and I’ve stunned several people with them. Yet, I have not commented on them to let you know how much I LOVE your recipes, pictures, etc.! 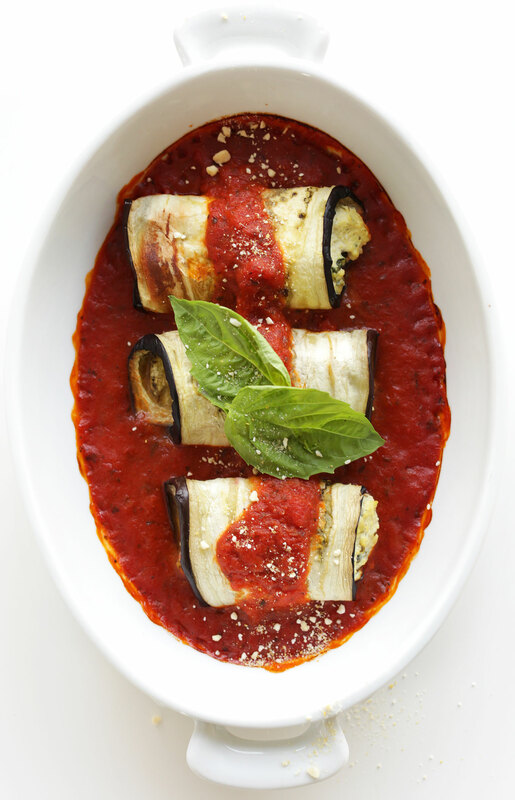 The other day I made this, and instead of roll-ups I layered the eggplant slices like traditional lasagna noodles. And the “ricotta” mixture- no words. Just YUM. Made this with much smaller eggplants but with the method and ingredients all the same….just had much more than 11-12. I think it ended up being 25 rolls ups. Not one was left behind. Huge hit! 10/10 Would make again. When I was putting them in the oven I was certain I was going to have leftovers for a couple days but nope! The family kept going back for seconds, thirds, and fourths. Delicious and Beautiful! Love this recipe! Had a hard time rolling them though so I just made it into lasagna. Also added garlic cause I can’t go without garlic in anything Italian! My husband and I made these last night and they were delicious, especially that tofu filling (which we also used as a sauce for some roasted potatoes we were making at the same time) — wow. Two minor suggestions. First, I think the step of drizzling olive oil on the eggplants before par-baking is missing (at least in the print-friendly version I used). I almost did it anyway, but didn’t because it wasn’t in the instructions I didn’t and our eggplants were a little tough because of it (although still delicious). Second, I wasn’t sure what size eggplants to use. We used two large eggplants and had way more than 12 slices, so I’m assuming they should be medium sized? I tried this. My husband and I loved it! I’m already a big fan of eggplant but that tofu filling was mind blowing! Anyways, thanks a lot for this deliciousness! im making these rollups tonight but instead of making my own ricotta i had some tofutti vegan ricotta so i just used that. I will let you know how it turns out its in the oven now. also i made your all in one bowl vegan choc. cake and all my coworkers loved they couldn’t even tell it was vegan!!!! I wanted to make this as a 1-2 serving dish as its just me at home. Would I just cut all the measurements in half? I know sometimes that ruins the flavor for some reason. No, that would work fine! YUMMMM!! I switched this recipe up a little and made it into a regular lasagne. I Did 2 layers of zucchini and 1 layer of eggplant, alternating sauce and your AMAZINGGG tofu ricotta! It cooked for 45 min. Almost all of my family devoured it. Even my 7 yr old brother who was told that the lasagna was like “normal lasagna” with pasta and cheese, ya know. He had noo idea he was being fed actual vegetables and tofu. I honestly like this lasagna better than the one i grew up with, shh don’t tell my mom. But my mom actually said it was better than hers so… also had a little left over the next day and for some reason it tasted even better! Had extra ricotta too and saving it to put on salads and such. Thanks for the great recipes and inspiration! I am 15 and have been vegan for 2 months now! It was hard at first being the only one in my family, but thanks to you i helped incorporate vegan dishes for my whole family! I made this last night and it was heavenly! Even my non-vegan fiancé loved it. Thank you for another awesome recipe! Whoop! Two wins for fiance-approved. Thanks for sharing! Much love to you for sharing these marvelous recipes. Looking forward to your cookbook release. I have made this dish twice. My husband, who is generally skeptical about vegan dishes, LOVED it. I mean scrapping his plate loved it. I just had the leftovers for lunch and it was still good two days later. Thanks kate! Glad I could help your skeptic husband be swayed a little toward plant power, even it just for one meal! Thanks for sharing! Absolutely LOVED this recipe. I made it tonight and got 6 servings out of it. I plan to eat this for lunch for the next few days….and I know I won’t regret it! Thank you. So great! Thanks for sharing, Donna! Love your recipes! I really want to try this, but I just noticed that the Vegan parmesan cheese is made with cashews, which my son is allergic to. (I know, huge bummer since it’s a base for SO many healthy recipes.) Anyway, do you have any ideas for a nut-free sub? TIA! I’ve heard brazil nuts also work well. Otherwise, hemp seeds or maybe even sunflower seeds! Also, almonds if he can! I just made these for dinner and they were absolutley DELICIOUS! I’ve never had a vegan cheese that was so ridiculously yummy and not “wow I’m eating vegan cheese” thought-invoking. Thank you so much for your recipes, they’re all devine! Can’t wait to try more! Oh goodness! Tried this recipe tonight, and that ricotta is aaaaamazing! My hubby and I are making the transition to a much more plant-based lifestyle, and your recipes have been such an inspiration! Thank you for your creativity and simplicity! Can’t wait until you next book. Dana, you’re the best! I did this recipe but sub the tofu with seitan(meat substitute) that I made my self. I minced the seitan with olive oil and stuff. This is the best dairy-free cheese sub i have had to date. I couldn’t stop eating it out of the bowl. Thank you for this. I miss cheese so much and this is a perfect sub! Leftover tofu ricotta atop a nice slice of your easy whole wheat bread is a DIVINE lunch! I made manicotti with the ricotta. So delicious, It almost never made it into the manicotti shells, I kept eating from the bowl! making this for my vegan Easter dinner with my family…looks incredible! I will let you know how it goes over with the “non-vegans”– I adore eggplant and have no doubt it will be absolutely delish! hello … i guess i am just ignorant, but what is “par-baked” and how long is it … i tried to google it and it only gave me how to do it with bread and dough… how long did you “par-bake” it …. did you cut them first before you par-baked it? thanks …. looking forward to making this soon! It just means bake it long enough to make it soft but not fully baked. 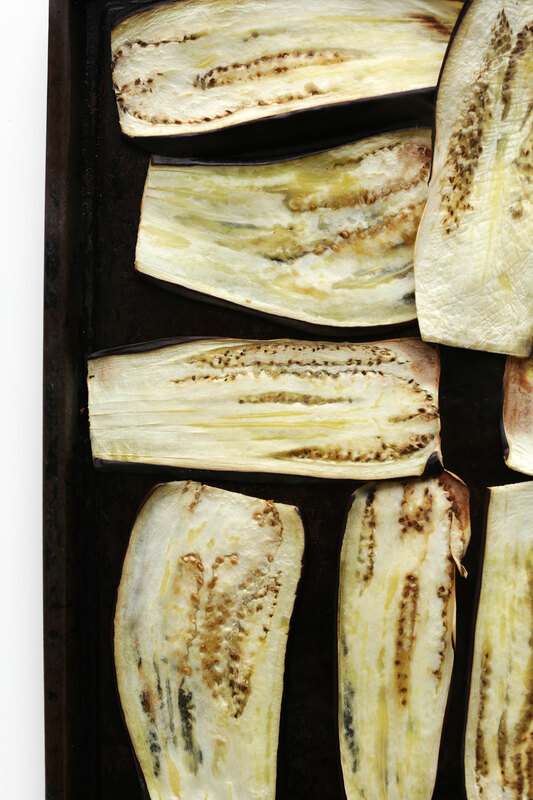 You slice the eggplant first, then salt it, then rinse, drain and dry it – as instructed. Then, drizzle it with a little olive oil and par bake it. Just follow the instructions and you should be good! Best of luck. How long would you say vegan parm lasts in the fridge? I’d say at least 1 month! Out of all the recipes I’ve tried from your site, this was my fav! The tofu ricotta filling was just DIVINE! Total staple in our household! Thanks Dana!! All of your recipes are awesome, but this one is seriously one of the best. The ricotta is absolutely to die for! It’s definitely going into my rotation. While slugging through estates reading (I totally get John’s law school misery) it dawned on me…that killer ricotta would make an awesome calzone!! Can’t wait! Brilliant! What a hit. Creamy and decadent don’t always go with healthy. In fact I would use the tofu filling as a dip or in salads or as a spread additionally. I just added garlic to the recipe. Bravo again! This recipe is absolutely delicious. I followed all your instructions closely and it turned out beautifully. Non-vegan husband and neighbor approved! Your site is an amazing resource, I’ve been going through your savory recipes and they’ve all been winners so far! I love that it’s mostly vegan but not completely, it’s exactly how my family eats! Thank you so much! So kind! Glad you and your family have been enjoying the recipes, Constance! Hmm, maybe it was sliced too thin? As for the leftover filling, add it on top of pizza, or even on sandwiches as a spread! 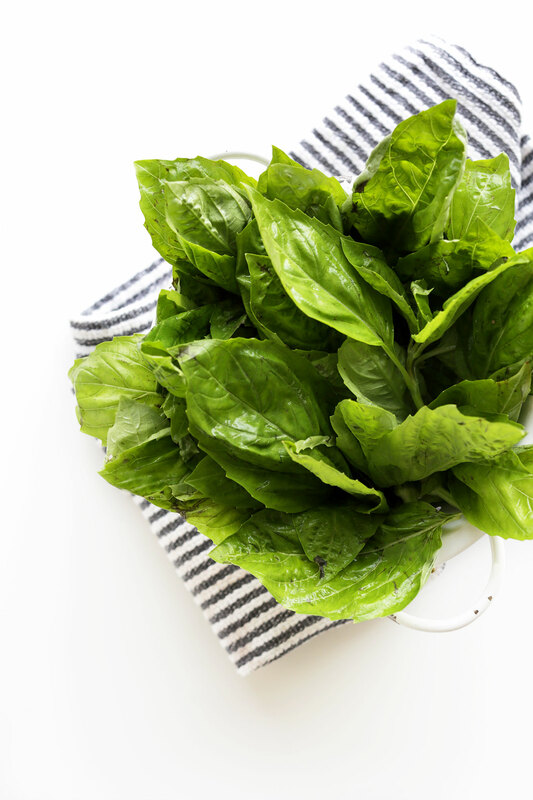 It’s an awesome addition to any Italian dish. Good luck Kelly! I was all set to say, “Great, another recipe for vegetarians that’s all full of cheese”, and then I read it. Now I can’t wait to try it. That ricotta deal could fill a lot of gaps. I don’t have any issues with pasta, so I’ll make it with traditional noodles, but I love eggplant parm, so now I can do it without cheese. Thanks! This rocked my world and somewhere out there a wheel of parmesan is thanking me for sparing it a slow cooked fate ;) By far the best tofu-vegan-lasagna I have made. Yet another hit! Thank you! This looks great! Dana, I don’t eat tofu, what could you recommend as a filling instead of it? Thanks. I made them tonight and loved them. I added sauted onion and fresh baby-spinach to the “ricotta”. Soooooo goooood!!! The dish tastes extremely decadent, but is quite the opposite if you look at the ingredient list. Five stars!! So far I loved all your recipes I have tried. This was my first Vegan meal. I loved it and am less scared to try other vegan recipes now. Thank you! No way! Eggplant lasagna, are you kidding me? This is genius. Not really a vegan but obsessing with eggplant and eggplant inspired recipe. Thank you so much dear for showing us a wonderful dish. I am making this right now! The ricotta filling is very luxurious and would double as a great vegetable dip. Is it ok to use your pictures with photo credit and link up to your blog for the recipe? Sure! See our about page for more details on recipe / photo sharing. What would you want your last meal to be is such a hard question! Who would have thought. There are so so so many options but I am thinking between now and then I must make this amazingness. YUM! I know, hardest question ever, right? Hope you love these! This recipie sounds so easy!! I saw this on Instagram on my bus ride home and then went to the grocery store asap! It was simple and delicious! Can’t wait for the leftovers. So great! Let me know how it goes! It is! Hope you give this one a try, Medha! OMG eggplant I love that! And it’s so so good as a pasta substitute! I’ve had decent tofu lasagnes in the past, but anytime I’ve tried to make them (even when using recipes given to me by friends) it always ended in disaster. As such, I wrote off making tofu vegan lasagne years ago. Your pictures of this looked so good and the recipe seemed so simple I decided to give it a whirl. This is the BEST tofu lasagne I have ever had, hand down! I doubled the recipe for the filling and made a small tray with organic lasagne noodles and soy mozzarella for my husband. I had plenty of filling to make the eggplant roll ups for myself. I will definitely be making this again. Next time I’ll probably sautee some vegetables and mushrooms to layer with the tofu “ricotta”. In the past I haven’t been happy with my attempts at pressing tofu. Instead, I slice my tofu and place it in a bowl, then pour boiling water on top and let it sit for about 5 minutes. Then I pour off the water and blot with a kitchen towel or paper towels. The end result is pretty much the same as pressing the tofu for a long time. I used that method for my lasagne filling and it worked great, as always. So great! Thanks for sharing, Debbie!! What can be used instead of tofu? This sounds incredible, and the homemade ricotta is on point! 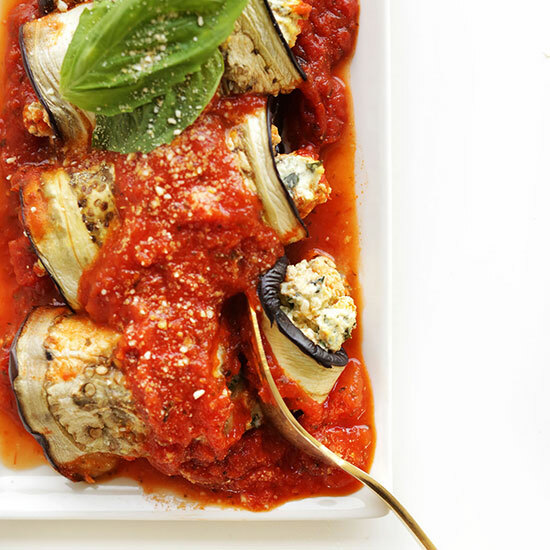 I fell in love with eggplant when I studied in Italy – I’ll definitely have to give this recipe a try! yummy! I love Eggplant, it’s a delicious but underrated vegetable! Oh, I just love this recipe! It looks so delicious. Woah, this looks incredible! I’ve always been anxious about even entertaining the thought of making lasagna, but this seems so doable. I also struggle with what to do with the eggplant I bring home, so thanks for solving all of my problems today! I love it. This is a seriously simple version! Hope you give it a try! OH! You’re on a roll, woman! I was just reviving from the utter brilliance that is the jackfruit pulled pork, and the next day, you post this! Man. You’re too kind! I hope you love this one, Evelyn!! I am totally in love with eggplant! Oddly enough, I love carb-y stuff but I’ve never been a devotee to lasagna- I think it’s because I didn’t grow up eating it. I honestly believe this means I just need to keep making make more lasagna like this and then I’ll fall in love! Zucchini works well- tastes so good! Thx very much! I am always looking for new eggplant recipes – this sounds great! I love this! The use of tofu in the “ricotta” is just brilliant. I suppose those huge garden zucchinis would be perfect “noodles” for this as well! Can’t wait to try it out! Yes! I haven’t tried it with zucchini yet but it’s on my list next! Do you peel your eggplant? If I am making eggplant parm. and need thin slices, I ask the produce department to slice it for me and they wrap it in saran wrap , so I can pay for it at check out. I want to make these vegan roll-ups !